Hamilton Hill was settled very early in Western Australia’s colonial history. In 1830, on his way to Mauritius, Captain George Robb arrived in Fremantle Harbour prepared to establish a farm, and chose a 2000-acre site to the south of Fremantle as a likely spot. This was a slice of land stretching from Hamilton Hill to North Lake. His farm manager was the first to use the name ‘Hamilton Hill’, in a letter home that August, although in newspapers of the 1840s it was referred to as “that delightful locality well known as ‘The Hamilton Hills’”. The colony’s first newspaper was printed on a neighbouring property by Charles MacFaull, the man who went on to print the West Australian. food and building materials to a rapidly expanding populace. Close to Fremantle and situated on both swampy gardening land and the coastal limestone ridge, Hamilton Hill became a site for food production, dairying, and limestone quarrying and burning. With the death of local landowner Lucius Manning in 1880, much of the Manning family’s large Davilak estate was subdivided into smaller blocks, allowing many new settlers to buy good market gardening land close to Fremantle. Later, George Robb's original grant was divided up into 42 smaller lots and offered for sale. Hamilton Hill was a popular site for small-scale abattoirs in this period, most specifically piggeries, such as 'Yapeen', the first slaughterhouse of William Watson of Watsonia. An abattoir inspector conducting an inspection through Hamilton Hill in 1903 visited at least ten small-scale piggeries between Fremantle and Bibra Lake. After the Public Abattoir Act of 1909 began to be enforced in the 1910s, slaughtering was no longer legally allowed in these small establishments, and the practice was discontinued. Along with the market gardens, fruit orchards and vineyards so common throughout the Cockburn district, Hamilton Hill was known for its lime quarries and kilns, though not as much as neighbouring Coogee. 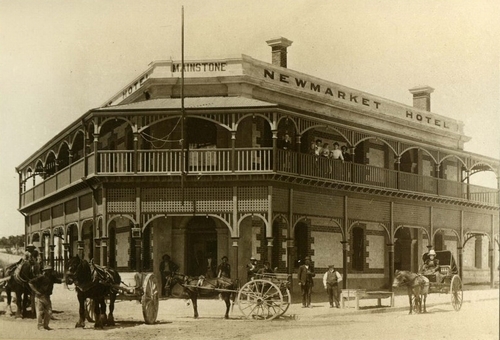 The Newmarket Hotel was built in 1905 to cater for workers at nearby Robb Jetty, and throughout the 20th century the coastal area was used to breed and train race horses, often stabled at Randwick. In 1925, after years of fundraising, the Hamilton Hill Memorial Hall was built to commemorate those men and women who left the area to serve in the First World War, some never to return. settlements at Bibra Lake and Jandakot which were still waiting in the 1950s. By 1954 the post-war industrial boom was seeing larger numbers of blue-collar workers need affordable housing near to their workplaces. A large chunk of Hamilton Hill was resumed by the State Housing Commission which began to build houses for the rapidly growing population of Perth. In the early 1960s, part of this resumption would become Coolbellup, outlining the beginnings of modern-day suburbia.